Additionally, with my own disposition of taste and substance for the past several years evolving into the avoidance of red protein sources of the primarily four legged variety, a draw towards this BBQ haven was hereabout both a surreal pull of genetic instinct as well as a mind-altering experience unto itself, not unlike my well documented fondness for other such reality disrupting substances ...... all in the spirit of my research of course! With taco's so messy, delicious, and with sauces sweet and tangy and with meats smoked and cured to the pique of tastiness, I could not resist a further investigation into the very source of this goodness and found myself pulling into the parking lot of The Salt Lick BBQ in Round Rock, TX. 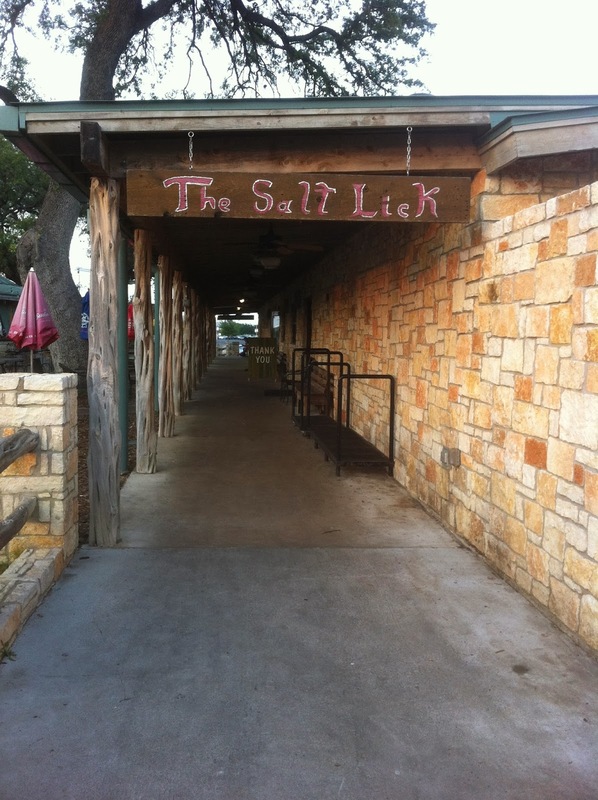 It should now also be granted and fully understood that this domicile is not the original Salt Lick location, which is in Driftwood and well outside of downtown Austin some 35 miles to the southwest. Regardless, my palate was grateful for the addition of this second location placed so close to my present accommodations in North Austin. On my traverse out to Round Rock nearly 15 miles from my Jollyville hotel, bemusement captured me as I was directed further east on Hwy 79 into what could be considered 'Amie's Pure Prairie League country', flat...dry....brown....and flat again, which summoned the distant yet distinct voice these Salt Lick owners must have heard ethereally floating in their minds: "If you build it, they will come..........."
My desire was to see what it was that had been built and what it was everyone was coming to see. The drive was interrupted ever so briefly however as I chanced upon a Historical Marker on the south side of the road and stopped to investigate what could be so historical out here on the flat plains of Texas. Before me stood HM #435, indicating the former presence of the Kenney Fort, erected in 1839 and used as an outpost of protection from the local native Comanche Indians. It seems 'Kenney' built this fort and used it as a protective way station for the U.S. Army and nearby ranchers, befriending the local Comanche's and living in seeming symbiotic harmony with them - until he was subsequently killed by them some 5 years later in 1844. Why this would have occurred and what promulgated such a violent end towards Mr. Kenney is nearly anyone's guess now some 170 years later, but this regions' sometimes antagonistic approach towards 'illegal settlers' and 'foreigners', perhaps this belief system is a deeply fervant quality borne straight out of the very Earth in these parts. History continues to be a bedeviling teacher to us all. Continuing onward I espied the Salt Lick location on the north side of the road sharing an entryway with the 'Williams County Old Settlers Association'. This being a Tuesday evening I was able to amble up unfettered and without hesitation, thus taking in the near surroundings at my own inquisitive pace. The parking lot and the outside of this barbecue estuary immediately drew my keen eye as it appeared that it was prepared to house and stand perhaps hundreds of people outdoors.....with an outside bar and completely separate 'loo house'. Benches and tables by the dozen ringed this outer area and an additional stroll past the entrance door towards the rear of the walk gave me insight into the possible strategy employed by the builders of this outpost for there behind the the Salt Lick, rising up out of acres and acres of fresh Texas asphalt, was Dell Diamond, the home of the Round Rock Express Baseball Club and no doubt source of hundreds of hungry mouths salivating for a satisfying Lick of Salt. Satisfied that The Salt Lick would not be wanting for foot traffic, I opened up the screened porch door, crossed the threshold and....... my disposition toward BBQ changed forever. Wide and expansive was the entryway, leading to an empty hostess stand some 30 ft. away and leaving what looked to be a wide and expansive lobby area for (Tuesday's non-existent) waiting patrons. To the right of the main lobby area near the entrance, and in plain open sight, was a kitchen somewhere out of an 1850's wagon train film with a large, round rock barbecue grill the size of a small swimming pool occupying one's eyesight and, despite the relatively sparse crowd, on this one large, open pit grill were the highly sought after briskets, ribs, loins, sausages, and chickens in demand throughout these parts. With eyes drawn towards the cooking meats I noticed movement to my left and noted the 'BBQ Maison' standing before me with an almost Ellstin Limehouse-like quality with large meat cleaver, dangling toothpick, and a demeanor that spoke of both gentleness with a wisp of danger combined. And it was a simple "Y'all wanna come back and take your pictures?' that told me my visual rapture and inquisitiveness had exceeded my usual cautionary approach and that such an error had not escaped this eagle eyed connoisseur, he with the Texas Panhandle sized meat cleaver. Before moving to left I watched as "Justified's" Ellstin threw wet pecan shells on the Live Oak wood fire to extinguish the flames and yet keep the heat. The fine mist of such a charcoal inbues a sweetness to the meat and eliminates a charred carbon rich taste and the smoky aroma set me to search for a seat to sample up this magic potion. Moving to the left of the waiting area I took a seat at the the long bar, taking particular note of the real 30' long 'tree branch' foot rest running underneath the length of the bar and the wide-bottomed leather swivel barstools. These were seats made to accommodate the large and the hungry. Now parched and thirsty I quickly took note of the draught beer selection: Blue Moon, Dos Equiis, 4 Sprocket Porter, Austin Amber, and a healthy plethora of other local choices along with the ubiquitous Bud Light. Gaining my bearings the barkeep approached with a quick 'What'll ya' have?' and delivered an Austin Amber almost twice as quickly. Then pointing at me he said 'Menu?" 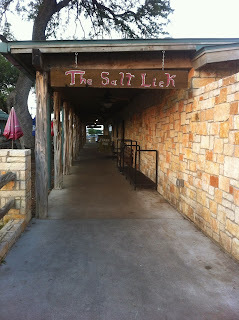 and a brief nod afforded me the Salt Lick Round Rock location listing. To the left of the bar there was a small flat screen airing a little bit of Round Ball but with the sound off. Even without any true crowd, the message was clear: 'You're not here to listen to the telly....."
Opening the menu and with a large intake of deliciously ice cold Austin Amber, I dove into the choices before me. Across the top it read: FAMILY STYLE MENU: $19.95/person....Heaping portions of Beef, Sausage, and Pork Ribs served with Potato Salad, Cole Slaw, and Beans, Bread, Pickles, and Onions. Next were the PLATES: Brisket Plate, Pork Rib Plate, Sausage Plate, Turkey Plate, Pulled Pork Plate, Chicken Plate, OR The Combo Plate (any two meats). And then the proof was further submitted that this was a certifiable feed lot house; the 'Specialty Plates' offerings. The Beef Rib Plate, Double Beef Rib Plate, TRIPLE Beef Rib Plate, The Rancher Plate (Brisket, Pork Ribs, Turkey and Sausage), Grandpa Thuman's Plate (Brisket, Pork Ribs, and Sausage), Senior Plates of ALL offerings, a Kid's Plate, and then..........came the Meat by the Pound Selections. My head was swimming and I began to feel dizzy. And still it continued.....Vegetable Plates, Half Chicken Plates, and as was the norm (I discovered) that all plates came with bread, pickles, and onions available upon request. "Hey Boss, ready to order?" by barkeep suddenly asked, albeit in an all pleasant and simply attentive manner. His demeanor said that he was busy with 1000 things but that at 4 minutes and 12 seconds after he handed me the menu his mind alerted him that it was time to check in on my well being. He was operating like a fine watch ....and it was order-taking time. "I'll have the Chicken Plate my good man......" I replied, whetting my whistle with another good quaff of ale. I was convinced that this Chicken Plate bevy would be plenty for my somewhat gaunt physique as it already included beans, potato salad, and cole slaw. "Bread, Pickles, and onions too, right?" 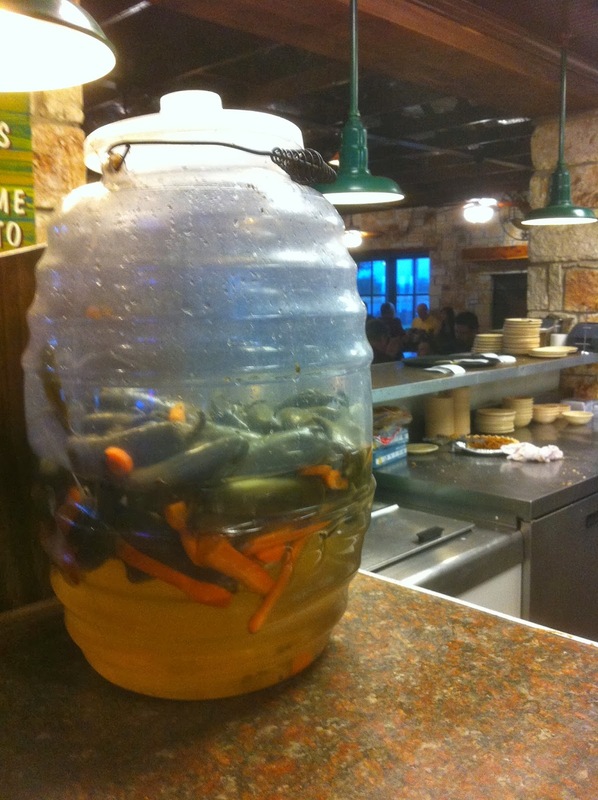 the Barkeep said, looking at me as if it was simply assumed, of course, this was how you ate BBQ at The Salt Lick. I nodded affirmatively. We were going all in on this case. And I believe I belched in anticipation. Reaching over to take another draw from my brew, I dabbed at my mouth to dry it from the cold glass when suddenly "BAM! ", a full plate of BBQ Chicken with baked beans, Golden Mashed potato's with slaw on the side was put onto the bar. It wasn't but two minutes since my order was taken and here was my desired choice placed before me lickety-split! And with a startled look I raised my eyes and "BAM", the full half slice of onions and the smelt-fish cut pickles were also laid before me. Immediately I noted that there was way too much food for me to hope to finish (and way too little BBQ Sauce for my liking but, then again, there would always be too little BBQ sauce.) And so began my venture into all that was fine and delicious at The Salt Lick. It was so simple yet so elegant. Chicken, beans, potato salad, and cole slaw......I'd seen it hundreds of times before. And yet, this rose to another level. For one, the BBQ Sauce was unlike anythig I had ever tasted before and with deep concentration and exactitude I ventured forth with another 'My Good Man......' and learned that the sauce was THE SECRET to this lair for it was made with nary a tomato! No Tomato's! No Citric Acid to turn, or pulpy flesh to burn and make bitter......THAT'S IT! It was stupendous and so SIMPLE! And with renewed gusto I waded in elbow deep and started a ravishment that would have had me drawn and quartered anywhere else but here it warranted not a glance. Much, much later, the time length of which escaped me for I was lethargically oblivious and overwhelmed with passion, I came out of my BBQ stupor, paid my bill slowly, took a last look at my third Amber Ale, and pushed back slowly from the bar and as I did I felt as I had taken on the aura of a true (albeit temporarily adopted) Texan. 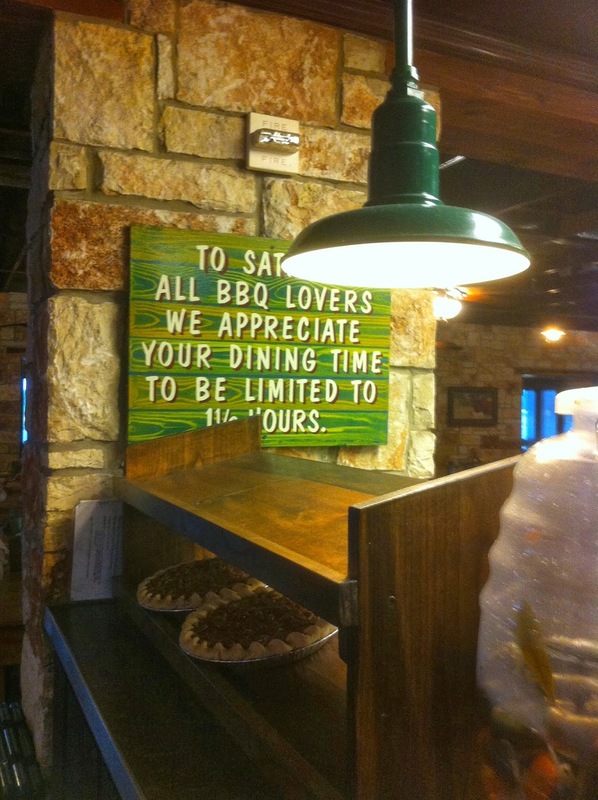 And with a glance at a large bee-hive jar of pickled jalapeno's keeping company with a shelf of fresh Pecan Pie's, I noted the urging of the management to all who might be enjoying their wares to the fullest: "TO satisfy all of BBQ lovers we appreciate your dining time to be limited to 1-1/2 hours." Move 'em on, Head 'em up, Head 'em up, Move 'em out, Move 'em on, Head 'em out, Rawhide!